Environment artist Kassondra Krahn discussed some of the methods she used to build the beutiful 3d scene with an oriental shrine. My name is Kassondra Krahn and I am originally from London, Ontario. I was born in Winnipeg, Manitoba, and now I call Vancouver my home, so I am a Canadian nomad of sorts! I initially went to the University of Guelph and studied Art History and Fine Arts, with an emphasis on oil painting and printmaking. After that I worked in art galleries for a few years and worked in sales, management and curating, and in 2015 decided to go back to school for Game Art & Design at the Vancouver Institute of Media Arts. Currently I work as an Environment Artist at Next Level games on an unannounced project, and I am so enjoying the video game industry! 3D Environment Art & Design is super fun, and I believe I have found a perfect niche for me to combine creativity and storytelling. I love the concept art work of Lok Du so I used his fantastical-Asian-inspired pieces as inspiration. I’ve been really interested in traveling to Asia for the past few years, and wanted to create some form of cliff-side shrine for a video game environment. I love the intriguing and asymmetric compositions of these mountainscape environments, as well as the incredible atmosphere and foliage. My first real step was creating a few textures for rock meshes, as I knew this piece would mainly consist of modular tiling textures. I did do a really quick greyblock, but really just went through trial and error by mashing textured forms together to find my composition. By making a few types of large rocks, it allowed me to quickly create cliff faces and get my main shapes down. Once I had the natural rock shapes down I basically built all the architecture and water into it. This method worked out well for this piece, but I’m not so sure I’d recommend it to others! Pre-production is essential, and a good concept art can save you buckets of time, but for this piece this just sort of came together for me in a fluid way. Almost everything in this scene is repeated dozens of time, using different size or colour variations. The only thing that is exempt from this is the dragon sculpture, which I treated as a hero piece. It is based on a real-life fountain in Nikko, Japan near the Toshogu Shrine that I have been in love with for a long time. Since everything is so modular I knew I needed some form of focal point, so this sculpture seemed perfect for this environment. It also gave mean opportunity to add a character element to this environment and refine my ZBrush skills. As I mentioned I created one large tiling rock texture for the massive cliffs, which was later blended with snow and moss textures, as well as layers of fog to help hide the repetitive nature. Then I created 3 or 4 smaller more detailed rocks, and a rock bridge/ archway. This way I could play with mashing and combining them together in Maya and Unreal to fill space and create forms. I made a few types of trees, and about a dozen different plant and flower meshes to fill the foliage and add the illusion of density. I also created a few versions of a wooden structure with a handmade wood and shingles texture, and just duplicated levels of windows and panelling to add height and variation. The only building that is really individual is the main one in the foreground, but even that is a mash up of pieces from the smaller, more conservative buildings. I think for any large environment modularity is essential, but its good to try to hide this fact by using colour variations, atmosphere, or light. I used a handful of tiling textures in this scene, however I managed to get a large amount of use from them by creating material instances in Unreal. This way I could slightly tint the texture and use it more often without seeming repetitive. To initially create these textures, I sculpted a high poly mesh and baked it down to a plane using xNormal. This is a great technique I learned from the super talented artist Julio Nicoletti during school. Basically I created base meshes for a few pieces of wood or stone or whatnot in Maya, brought it into ZBrush, sculpted like crazy on it, decimated the four or five wood planks or stones, and brought it back into Maya. Then using the grid and snap tool I aligned them into a square, being sure to place anything that goes over the edge on the exact opposite side as well so it tiles correctly. Using this as my “high”, I used a plane that was the exact size of the Maya grid as my “low”. This is absolutely a time consuming process, but you get almost perfect normal map bakes every time, which is so satisfying. It also gives you really great height maps, which look great (especially in Marmoset!). Since I knew I’d be using these five or so textures for most of the environment I spent quite a long time making sure they were as high quality as possible. Along with this technique I used vertex blending in Unreal to achieve a natural appearance for my ground plane. Using a four channel vertex colour blend allowed me to transition between between stone path (with a texture I created using the above method), to a pebble/dirt texture, to a purely dirt/mud texture and finally into a grass texture. Using this and combining it with actual grass alphas on modelled planes really helped create a believable and blended ground for my environment. For lighting I used a main directional light tinted slightly blue to simulate moonlight. However for such a large scene I found there were areas that were far too dark, so I “cheated” and added some spotlights with a very low strength to lessen the shadows and show off my textures. I also added small point lights with an orange tint to create warm pockets of light wherever there were any torches. Lighting is really the icing on top of any environment, and it’s really something that should be considered throughout the entire process. There is no point modeling something extensively if it’s going to be in a dark area, so knowing your lighting beforehand can save you a ton of time! This scene is very large; the largest I’ve made, so there were definitely some difficulties. I wanted to be ambitious and use my modular assets as much as possible, but it can be hard to keep track of such a large scene inside unreal. Since I worked more organically with this environment, and not so much from a direct concept, it was hard to know “when to stop” since I sort of found the mood of the piece as I went along. It can also be difficult to capture your environment through camera work, since it is such an expansive piece. 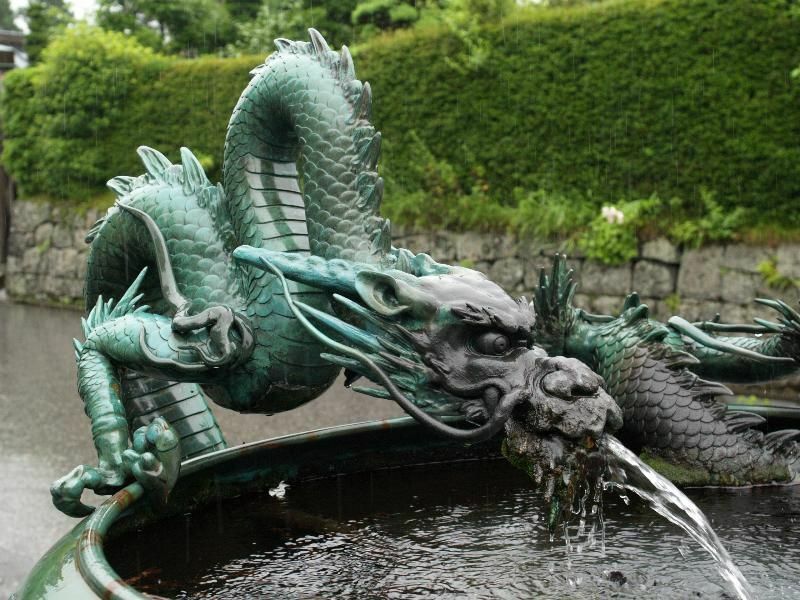 The dragon sculpture was also a challenge, as its intricate form and winding body were not straightforward to model. Creating the scales was one of the most difficult parts, as hand sculpting them would have taken ages. How I approached this was by uv-ing the body into a perfectly straight and uniform rectangular island, and applying a tiling “scale” texture I created in photoshop. Then in Zbrush I masked by colour, to select only the dark sections between the scales, inverted this mask, and then “inflated” this mask. This extruded out the scales only, which were for the most part all uniform in size and shape. Figuring out exactly how to do this was a struggle, but it worked out pretty well and I managed to get some good normal maps for my low poly bake. Overall this was a really fun scene, and I enjoyed the organic approach I took to creating it. I really am passionate about texture painting and took this as a priority in the piece. With this environment I really tried to achieve an overall feeling and mood, since it was so large in scale, and hope to evoke an emotional response from the viewer when they see it. Thanks 80 lvl for the awesome interview! Very good work! Did you find it easier to begin positioning your assets once you were in Unreal or do you build the world in Maya and then export to Unreal? This is something I am grappling with at the moment because I find much more precise controls on modeling software but the scene is usually better organized if I build my assets in the game engine.